Finalist for the Spur Award for poetry from Western Writers of America. Madden's second collection of poems centers around a group of poems that focus on the Battle of Little Big Horn in 1876. Tom Madden's poems sing of life, of rich histories, and the sad and beautiful landscapes that make us mourn and rejoice. His voice is quiet but insistent. Here, he is saying, look closely, more closely at the soul of the American West and our place here. This is a profound and beautiful collection. 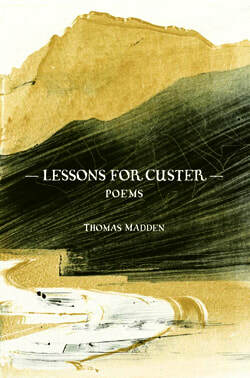 These small room into which Thomas Madden leads us, quietly, hand in hand, burst with treasure. Here are memory poems and elegies, poems of Western history and landscape, informed by Thomas Madden's attempt to deal with "time speeding on a hazy clock." The poet's equipment? The receptive skin of the body, thought, voice...Such steady power and clarity make me believe Thomas Madden serves a muse of wind and grasses. Lessons for Custer offers a great appreciation for the lives within the natural world--the equal sanctity of animals and ourselves within the boundary of our bodies. There is also a detailed and true appreciate of place which sustains all of us in poetry. Finally, the great and grounded imagination in the title sequence tempers the historical in view of our common transience, of the sould of nature, and illustrates the vainglory of those who fail to revere the gift of our life on earth. Thomas Madden has for many years been reflecting on the interactions between European immigrants and North American Indian peoples. He was born in Montana, where his family (all European immigrants) settled at various times in the 1880s. He studied at the University of Montana where he was a student of the poet Richard Hugo, and at the University of Oregon. Madden is a retired professor of English at Eastern Oregon University.